Our Pont Du Gard and Avignon Tour Includes: Our private Avignon tour with Pont du Gard includes private transportation and English speaking tour guide, parking and tolls, entrance tickets to Pope’s Palace. Departure Points: Arles, St. Remy, Aix, Marseille and vicinity. Other departure points available. Please inquire. 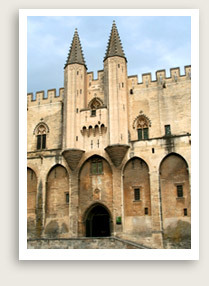 This Provence private tours features Avignon, home of the papacy in the 14th century, and perhaps the largest and the most beautiful house of the Gothic world. You’ll have the “chance to dance on the Old Bridge St Benezet,” as the song goes, and discover the rich architectural heritage (churches, former bishoprics, clock towers). After your Avignon tour and lunch, your private tour of Provence continues to Pont du Gard. This huge, perfectly preserved Roman aqueduct supplied running water to the city of Nimes and beyond. This marvel of engineering work has endured two millennia, attracting scientists, artists and visitors from all over the world. Your guide will show you the 1,000-year-old olive tree a few yards away from this incredible site. This is one of the highlights of this Pont du Gard and Avignon tour. This magnificent monument is situated at the rim of Gardon Canyon. From its heights, one can admire the landscape of the valley and follow the flow of the Gard River, tributary of the Rhône.